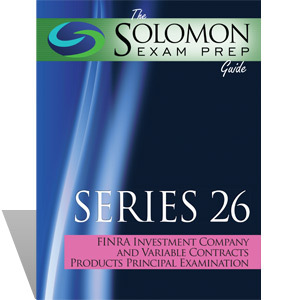 The Solomon Exam Prep Guide to the Series 26 FINRA Investment Company and Variable Contracts Products Principal Qualification Examination offers an efficient and skillful overview of what you need to know to pass the Series 26 exam. By focusing on the most important aspects of the exam, and including lots of exercises and practice questions, as well as a glossary, the Solomon Exam Prep Guide will get you on track to passing the Series 26 in no time. The Series 26 Exam Study Guide is available as an online digital study manual via your online student dashboard (requires Internet connection/not downloadable) or as a hard copy textbook (shipping & handling will apply). Please note: the digital guide and hard copy guide contain the same content, however, this image is a PDF of the hard copy guide and the digital guide is not a PDF and it does not look exactly the same as this PDF of the hard copy. If you want this exact look, you must purchase the hard copy upgrade..
How do I register to take the Series 26? To take the Series 26, a FINRA member firm must file a Form U4 application on your behalf through FINRA’s Central Registration Depository (CRD). At least one of the following licenses is a prerequisite to attempt the Series 26 exam: Series 6 or Series 7. You will also have to get fingerprinted and answer a lengthy set of questions about your background. What does the Series 26 qualify me to do? A Series 26 license will qualify you to function as a principal for the solicitation, purchase, and/or sale of redeemable securities of companies registered pursuant to the Investment Company Act of 1940; securities of closed-end companies registered pursuant to the Investment Company Act of 1940 during the period of original distribution only; and variable contracts and insurance premium funding programs and other contracts issued by an insurance company. We recommend studying 80 hours over a four-week period. A score of 70% is required for passing. Note: Your score will be rounded down to the lowest whole number (e.g. 69.9% would be a final score of 69%--not a passing score for the Series 26 Exam). There are 110 scored and 10 unscored questions. These 10 unscored questions are randomly distributed so test-takers do not know which questions are not scored. The unscored questions are being tried out by the exam committee. Two hours and 45 minutes. You are allowed to take restroom breaks during the exam; however, the clock will continue counting down. Please contact your preferred testing center for additional information. The cost of the exam is $100 at this writing. If I stop working for my firm, how long will my Series 26 license remain active? When you cease working for a firm, your employer will file a Form U5 to terminate your registration. Your next employer will file a Form U4, which will re-register you. As long as you do not exceed two years between employers, your Series 65 license will remain active. I utilized a competitor's product and failed the first time I took the Series 53. It wasn't from the lack of studying. After researching what other courses to buy, I luckily found Solomon. The exam material was up to date and the practice exams were much more challenging than the other program. I would highly recommend Solomon and plan on utilizing them if I should have to take another exam. Thank you. I never would have passed the 79 if not for Karen and Solomon Exam Prep. Thanks guys!